It’s always a fun and exciting time at Baja Amusements. 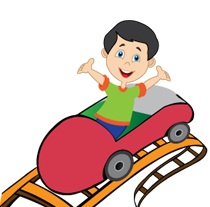 Ocean City's fastest go-karts, family tracks, miniature golf, video arcade, bumper boats, and more. 10 acres of exciting family fun. Go-karting is one activity that unites both kids and adults. Kids love getting behind the wheel. Cool off from racing on our water blaster bumper boats while drenching friends and family too! Scale to new heights on our 24' & 32' climbing walls. The whole family will enjoy scaling to new heights on either of our climbing walls. Wacky Worm Roller Coaster, Frog Hopper & Carousel: Young kids have their fun while Mom & Dad ride along. Never miss the arcade and Over 40 video games! Play to win prizes or to beat the highest score! Print this coupon and present it during your visit.